* I usually just average the ratings for the frosting and the cake for the Overall rating, but I'm giving it a higher Overall rating because the marshmallow filling really did give it the flavor and nostalgia of a Hostess cupcake. Nicely done. Check out the famous Cupcakes Take the Cake. Cupcake Race wrote an article for their blog. Congratulations Shari! 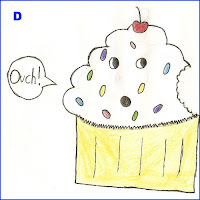 You won the Cupcake Race contest for the readers' favorite cupcake art! All of the finalists were really great, but with 48% of the vote, the Cupcake Race readers voiced a clear favorite! The Grand Prize winner, Harper, will be receiving a t-shirt with his cupcake drawing on it, and Shari will receive a $10 gift certificate to Sweet Honeybee Bakery, on Montrose Ave. (one of our favorite bakeries!). We'd love to hear from you and Harper if you would like to write something on the blog about what inspired your idea and why you like art...or anything you'd like to write. And finally, congratulations are in order to everyone who participated in the contest to create some really fun, inspired and interesting art! We had a lot of fun with the contest here, and we hope you did too. Don't forget to vote your favorite! 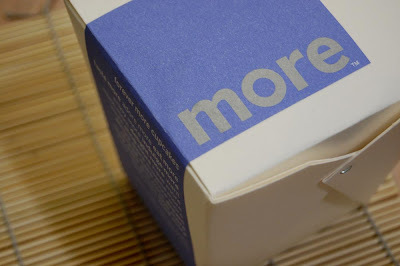 There is still one more prize to give away! 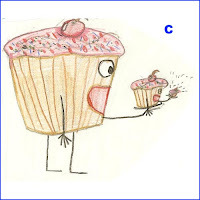 The Grand Prize went to Harper F., whose drawing of a cupcake on the rampage can be seen in the previous post. 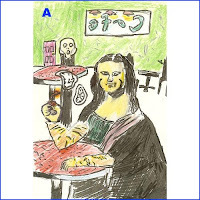 But there is still First Prize to award, which will be determined by the winner of the online poll (see sidebar). Voting ends at 11:59pm on November 19th. Click here to view the finalists and vote. The winner of First Prize will get some suitable award -- probably a gift certificate for a couple of cupcakes -- and, of course, have his or her drawing featured on cupcakerace.com. 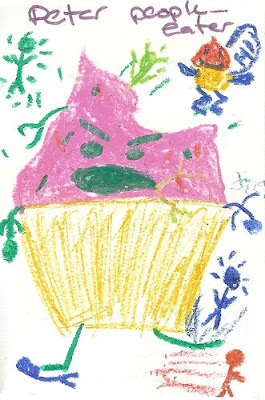 The entries for the Cupcake Race Art Contest are in! If you recall, the kids at Pilgrim Lutheran School in Chicago were invited to create original cupcake-themed artwork for the contest. You can see all of the excellent drawings by clicking on the Flickr link on the sidebar at the right. Before announcing the winners, let me remind you how the contest works. 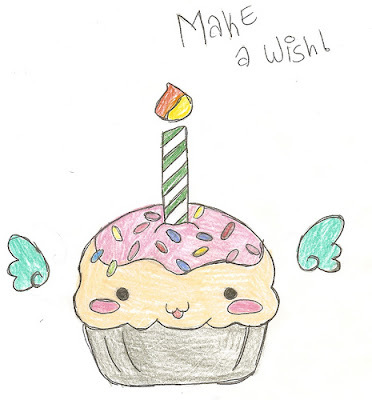 Cupcake Race will select the top five (5) drawings from among all the entries. From these, one Grand Prize winner will be selected by Cupcake Race. The Grand Prize winner will receive a t-shirt in addition to having his or her art featured on cupcakerace.com. In addition, his or her entire class will receive cupcakes! Of the remaining four (4) finalists, a First Prize winner will be selected by readers (you!) in an online poll. The First Prize winner will also have his or her artwork featured on cupcakerace.com. Congratulations Harper! I just love that angry, determined look on Peter People Eater's face! It says, "Payback time, people!" Thank you for sharing your art with us! The remaining 4 finalists' artwork is shown below. Please vote for your favorite at the top of the page. The online poll closes at 11:59 PM on November 19th. Announcing the Cupcake Race Art Contest! 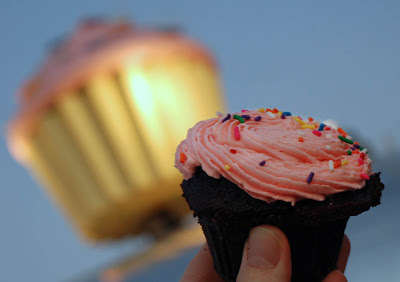 Cupcake Race is sponsoring its first ever contest! The kids at Pilgrim Lutheran School in Chicago will be creating original art that represents some idea they have that involves cupcakes. It might be their concept of what the "perfect" cupcake would look like. Or maybe their interpretation of what a cupcake's worst nightmare would be. What would a family of cupcakes do for vacation? 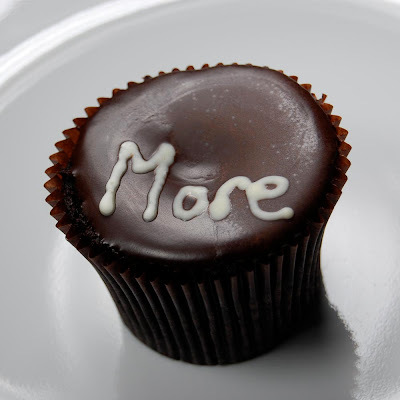 Whatever concept or idea regarding cupcakes they wish to convey. The basic guideline is that it has to be original and it has to cupcake-themed. 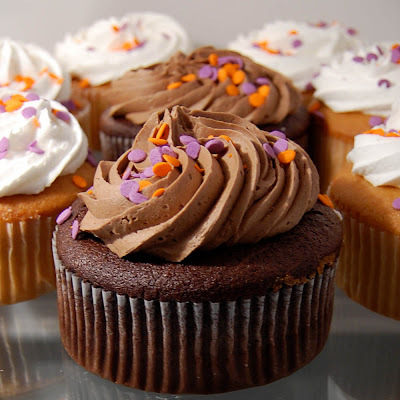 Cupcake Race will narrow the contestants down to the top five (5), and choose one (1) Grand Prize winner. The winner will receive a t-shirt and have his or her art featured on cupcakerace.com. In addition, the winner's ENTIRE CLASS will receive cupcakes! The remaining four (4) finalists will participate in an online poll, where readers get to vote for their favorite of the four. 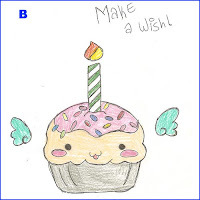 The winner of the on-line poll will also have their art featured on cupcakerace.com. Both the Grand Prize winner and the winner of the online favorite will get to write on cupcakerace.com about what inspired their idea and anything they want to share about their art, if they so desire. The students will be submitting their entries by November 7th, and the entries will be posted online as soon thereafter as possible. Voting for the online poll will run for ten (10) days. Finally, I want to thank my blogger friend Beck for collaborating and making this idea possible! Way to go Beck!! Okay kids, go forth and cupcake! Cupcake Race Goes to Austin, TX! 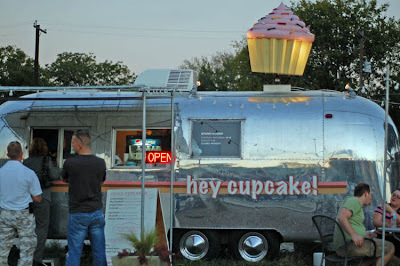 Overall I did some Googling for cupcakes in Austin and came across Hey Cupcake! On my way, I envisioned a cupcake stand, but I didn't picture a cupcake stand fashioned out of an Airstream trailer parked in an empty lot. But, hey, it's Texas afterall. I was staying at the Four Seasons (love those corporate rates!) and asked the concierge for the address of Hey Cupcake! With the same seriousness and professionalism as if I had just asked for reservations at the finest steakhouse in Austin and orchestra prime seats at the opera, he found the information and printed it for me. Then, although I had asked for a mere taxi, the valet instead called the hotel driver. So there I am, being chauffeured in a shiny black Lincoln Continental, to a gravel parking lot where there sits only a cupcake trailer and a couple of patio tables. I can only imagine what people thought as they watched me step out of the limo, walk up to the trailer and order a cupcake. The driver offered to stay and wait for me, but, feeling slightly embarrassed, I told him I'd just try to find a taxi on the way back. This is a Flickr badge showing public photos and videos from cupcakerace. Make your own badge here. 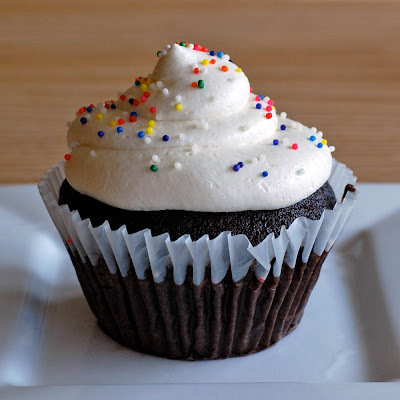 3 - You call this a cupcake? 2 - Eww, spit it out! The reviews here are merely the opinion of someone whose only credentials consist of a sweet tooth. The weights shown are actual weights and were taken from a sample size of a single cupcake and should not be considered either an average or to be representative of all cupcakes from a particular bakery. Prices reflected here are as of the date of purchase and include local tax. Photographs were taken by the blog editor.